Historically, restaurants and recessions don't pair well. But it doesn't appear last year's "down economy" stopped Vermonters from eating out. There's good news to report from the food front: A number of restaurateurs had the courage to open new establishments in 2009. Stowe celebrated the arrival of Santos Cocina Latina, a bona fide Latin American eatery complete with sensuous ceviche and tropical-fruit desserts. Three Penny Taproom on Montpelier's Main Street serves steins of specialty brews from around the world. Burlington's Bluebird Tavern, a gastropub offering everything from gravy fries to sea-urchin roe and bone marrow, was a semifinalist for the national Best New Restaurant award from the James Beard Foundation. And 2010 promises more great entrées to the Vermont restaurant scene. One is a Spanish tapas joint; another will dish up "twisted comfort food." Finally, it can't get much better than this: A Burlington pub — to feature localvore burgers, artisan cheeses and casks of great beer — has taken over the Bank Street location that once housed a McDonald's. Chefs and consumers are benefiting from better access to local goods year round. Winter farmers markets and all-season farm shares have sprung up around the state, and the proliferation of greenhouses ensures that baby lettuces and sprouts can be had in the dead of winter. Other hot trends: hand-rolled pastas, butcher boards piled high with pâté and house-cured salami, and straight-from-the-garden cocktails enhanced by fresh herbs, fruits and veggies. New artisan breweries and distilleries are cropping up, too, which means Vermont gin will soon be on the table alongside the state's excellent vodkas and maple liqueurs. To help you find your tipple of choice, we've printed a list of Green Mountain booze makers. You can find it just before the index and next to our selection of "destination" restaurants that lie outside the 7 Nights circulation area. Seven Days continues to expand its food coverage. Thousands now receive our weekly Bite Club e-newsletter, which includes links to our food stories, culinary jobs, exciting events and mini restaurant reviews — before the paper hits the streets. Our online food forum lets culinary devotees discuss everything from gardening to recipes. You can also follow food editor Suzanne Podhaizer's and food writer Alice Levitt's tasty Twitter tweets under the names "feedmenow" and "aliceeats," respectively. 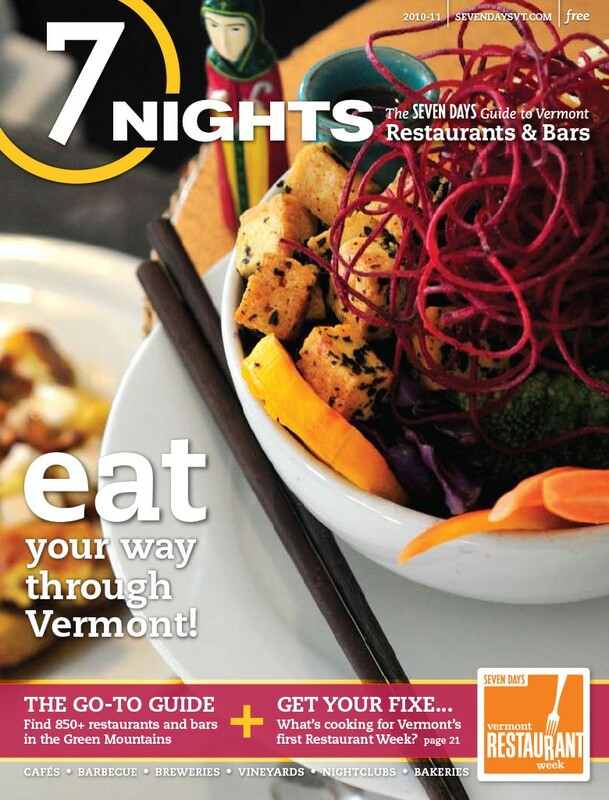 The biggest news: Seven Days has brought the popular "restaurant week" concept to Vermont, with lots of delicious events and 50-plus participating eateries offering prix-fixe menus for a week in May. See what's cooking at vermontrestaurantweek.com.